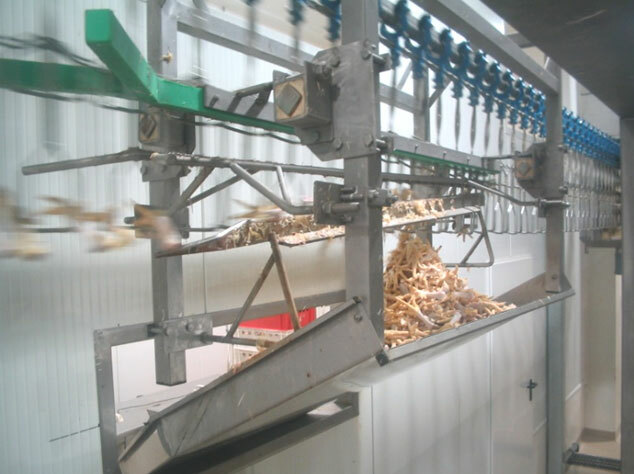 The unloader is a mechanical, operator-less device, designed for unloading processed poultry carcasses or feet. The unloader is made of stainless, acid-resistant materials and food approved plastic. The unloader is mounted to a straight section of the overhead conveyor, where the processing cycle has finished and shackles must be emptied. 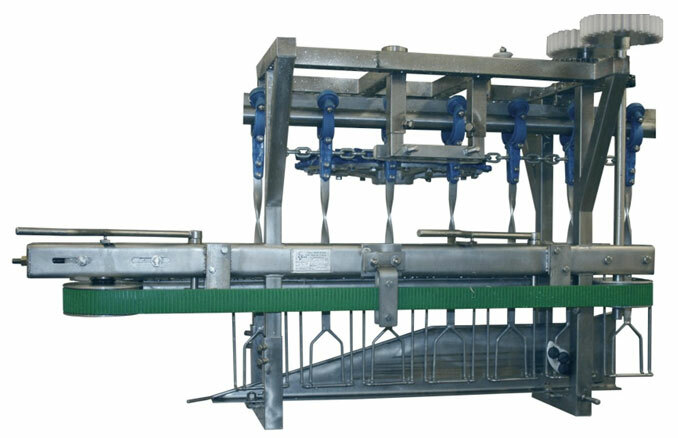 Unloading can be performed at any section of the slaughtering process. The unloader is designed to work with rack shackles. The simple unloader with a drive unit is designed for unloading feet from shackles of the overhead conveyor. The frame is mounted to the supporting structure of the overhead conveyor. After starting the conveyor, trolleys moving along the track cause rotation of the drive wheel. Then, drive is transferred by the chain transmission and gear wheels to the rubber gear belts. Immobilised by the clamped belts, shackles move along the unloading strip, and feet are pushed upwards and fall into the container below.